America…Do I have to come back already? Yes, I may be craving some good Mexican food and a real hamburger at In-N-Out, but that doesn’t mean I am ready to go back to California just yet. Can I not stay here and continue to, “go to school”? You see I don’t really call this school, even though I have learned so much more this quarter than ever before. As my fellow classmates and I say, this Winter quarter is like an educational vacation. It is freshman year all over again. Everyone is living under the same roof, with our RA’s, Tom and Jacky, attempting to steer us clear of trouble. I said that they attempt to steer us away from those embarrassing situations. At this point of our vacation though, they know more about us than most professors should know about their students. Friday morning office hours at a wine bar to go over the group projects few have started end up turning into stories from the night before, what bars we went to, and who was the drunkest. The best piece of advice received from our professor was, “looks like some of you need a bloody mary right now.” Hats off to that. Sometimes our professors wonder why we students think we have to drink most every night of the week. The answer is that for most of us it is illegal to drink back home. This vacation gives many of us youngsters the chance to feel like we are 21. The question, wait what if we get caught, no longer applies. And for those already 21 and over, they are just reliving their youngster years when they didn’t have to worry about jobs and such. All of us students agree on one thing though. When you get a chance to drink with your professors, never pass it up. Some of the best memories are made with a drink in hand, enjoying activities Cal Poly probably doesn’t know it is paying for, or at least wouldn’t ever pay for at home. Unfortunately, these memory-making experiences are about to come to a screeching halt as our educational vacation nears its end. I am not sure what I am going to miss more when I get home, the laid back education or all the time spent with such a great group of people. Most quarters at Cal Poly I am kept very busy with readings, homework, and way too many midterms and finals. Here in Australia, it has been a whole different experience. Our classes revolve around the Learn by Doing Motto, with most of our time spent attending wine tasting events and visiting educational locations in person. I often feel that our professors enjoy getting out of the classroom to explore and have fun just as much as we do. This upcoming Spring quarter is going to be a rude awakening when I have class without all of my great friends. More importantly, my classes won’t be taught by one of the two greatest professors ever. Having such a fun and outgoing group makes time fly by to fast. The people are what make this learning experience into more of a dream vacation, always willing to explore and try new things. It seems like just last week when we were overwhelmed with our jam-packed calendar of activities for the quarter. It seemed like we never had a break. Now, I just want to rewind and get to do it all over again. Maybe this time around I will let loose and hold a koala, try to surf bigger waves, and pay a lot less attention to the conversations going on in the back of the bus. No matter how much I want to stall the end of this trip, it is inevitable that I have to go home. Now I look forward to reliving all of my Australia memories through pictures and stories I will share with friends and family. Although it won’t be the same thing, my stories and pictures will forever remind me of this educational vacation and the people I got to share it with. Hopefully our group will continue to celebrate this Australian quarter with our reunions back at Cal Poly. I know I will have to stop by office hours, in a boring office space, and visit Tom and Jacky. Can my new dysfunctional family and I all study abroad again next year and continue our journey together? Please!? Let me just get this out there. My patience at times runs very thin. I am one who likes to be prepared and arrive early so I can accomplish what I set out to do. On this journey to Australia, I have learned to always try and plan to leave earlier than we need to because there is usually someone running just a little late. Well not exactly running late, but much slower than the rest of us. This individual likes to enjoy the moment, moving slowly to take in every bit of their surroundings. It is a tortoise and hare situation. The race is to see and experience as much of Australia as we can. I, the hare, find myself hustling around, enjoying the sights and attractions, and then hustling to the next place. The tortoise is on this same journey. However, the tortoise takes its time to read every description at the attractions, and then casually wanders to the next destination. Rarely does it find itself or recognize any need to be in a hurry. There may be a train to catch, but the tortoise somehow always manages to make it. This is hard to say, but I actually learned something from how the tortoise approaches life and always takes a minute to, “stop and smell the flowers.” That is what my 100 year old Great Grandma likes to say in between commenting on how nice the clouds are and how difficult that red big rig may be to back up. Long story, but lets just say I sat next to her on a drive from California to Wyoming and learned every few miles about the clouds and backing up red big rigs. My neck from nodding that whole journey wasn’t as sore as my legs as I attempted to race through all Sydney had to offer last weekend. Arriving in Sydney, I was on a mission to see everything I could in three short days. I had researched places to eat and lots of destinations, having every minute nearly planned out. However, after my four hour walking tour, I had seen most of the sights Sydney had to offer. Well what do I do now that I, the hare, have seen most everything I came for? My answer was to sit on a bench and relax, and give my aching legs a seconds rest. As I stood up from the bench, I was on a different sort of mission. My legs were stiff so I slowly headed out for the non-touristy destinations. Wandering the piers and exploring the botanical gardens were things I had never scheduled. I don’t think I have ever casually moved that slowly. My tortoise like speed paid off, as I discovered views and opportunities that were unbelievable. Sights ranging from cliff top views of the Sydney Opera House and Bridge to a dock full of mega yachts. Heck, I even got to witness One Direction getting on a yacht headed for a harbor tour. As I prepared to board my plane home after three days in Sydney, I was kind of sad to leave. I came to realize how much more I was able to take in and see from just wandering slowly such as the tortoise. If I had taken the hare’s approach to Sydney, I would have seen only the main attractions and have been ready to board my plane home. Both the tortoise and the hare accomplished the same goal I had of seeing Sydney. However, the tortoise made more memories and got to experience what Sydney was really like away from the mass of tourists. Am I really getting credits for this? Lets be honest here. My first wine drinking experience was definitely one to remember. I was volunteering at a charity dinner with the Young Cattlemen’s Club Fall Quarter of my freshman year. The setting was unbelievable, as the event was at the Hearst Castle. Overlooking the Pacific Ocean, they gave us a table for the New York steak dinner. Reaching across the table for who knows what, my clumsy self elbowed my glass of red wine, spilling it all over my neighbor and myself. Here I was sitting amongst strangers, trying to make friends, with a big red stain on my lap. That was the only time I drank wine before coming to Australia. Adelaide has given me the opportunity to broaden my senses and gain a new outlook on wine. Even though I am 8,000 miles from San Luis Obispo, Cal Poly’s “Learn by Doing” motto holds strong. When asked what I do for class here in Australia, my answer is, “explore and drink wine.” Not sure what President Armstrong would think of that answer. In truth, I have learned so much more by getting out of the classroom and experiencing what I am being taught firsthand. It is like I am on vacation instead of going to school. Not many students can say they have a very busy week of school consisting of wine tasting, wildlife tours, and horse races. You might say that Cal Poly has its own wine and viticulture program as well as a horse racing class, so why go to Australia to learn. Besides just getting to experience the Australian way of life, the Cal Poly in Australia program takes “Learn by Doing” to the next level. My wine knowledge besides how to spill it was a blank slate at the start of the program. Through many wine tours and tastings for class, I have learned more about the wine making process, both at boutique and commercial scale wineries. My palate is better trained to taste the unique qualities, as well as downfalls, of different wine varieties. Although it may take me awhile, I am better at smelling for aromas brought out through the wine making process. As well as learning about Australia’s maritime history and how to appreciate wine, I am also learning valuable life lessons. I have never been a good public speaker, especially with impromptu speeches. When I had my public communications class my friends and I tried to calm our nerves with a few sips of alcohol before our speeches. On our first wine tasting experience to the McLaren Vale, I witnessed what happens when you take a few too many sips before giving a speech. This however was “Learn by Seeing”, and didn’t teach me much. Just a few weeks later in our Wine Essentials (how to taste wine) class, I ended up just a few sips away from giving my own speech. Good thing my fellow wine connoisseur, aka professor, called me out and put a stop to my attempt at an embarrassing “Learn by Doing” moment. I was taught through this how not to push my limits when wine tasting. When I get back to a real Cal Poly schedule, it may take me some time to get back on the lecture schedule. No longer will class consist of drinking with professors and petting koalas. A fellow Cal Poly in Australia student says it best, “Ugh. Dreading another day of class…said no Cal Poly Study Abroad Student ever.” Through the “Learn by Doing” motto, this program provides an education on the wine industry some people spend years learning. Even if you don’t like wine, you may as well try it. Wine not? Oh how I wish I hadn’t spilled that glass of red wine. It definitely delayed my appreciation for wine. It was like a battle of conscience. My two favorite songs I try to live my life by were both telling me to do different things. Who should I listen to? Chris or Garth? As Miley Cyrus would have said back in her good days, “You get the best of both worlds,” or as I think, you make the best of both worlds. No, that is not my favorite song or singer. And so that is why I find myself here in Adelaide, Australia making memories and friends that will last a lifetime. Chris Ledoux, although not as well known as his best friend Garth Brooks, grew up beneath the big western skies of Kaycee, Wyoming. Chris may be the name to fame of the 260 people town, but it is also where my mom was born and raised. Chris sang about the cowboy way of life, a life I am proud to have grown up in. His song “Western Skies” is about how Garth tried to get him to pack up and move to Nashville. Chris would never leave Kaycee, as his home has always been and since his death will always be, “beneath these western skies.” Garth Brooks, a country legend, references his fallen cowboy friend in many of his songs. The River, not one of Garth’s top hits, is about how a river is ever changing, and a dreamer is just a vessel that must follow the river’s path. My dilemma was whether I should follow my dreams and experience Australia, even under the city lights, or stay where I can hear the coyotes call at night. As you may be able to guess, it is not coyotes that I hear at night, but the sound of crosswalks below. Yes, I, the person who hates going to cities such as San Francisco and L.A., am living on the third floor of a 17-floor building. My river of dreams flowed here to Adelaide. My first few days in the city were hectic. I couldn’t just go up a hill to find my bearings, but instead had to rely on lots of wandering to get to my destination. Thankfully though, I have come to realize that Adelaide is not like S.F. or L.A. To Chris: Adelaide may not be the vast open range of Kaycee, but if there were a city you had to live in for a short time, this is the one. There is plenty of elbowroom, everyone is friendly and helpful, there are parks and gardens throughout, and most importantly, it is clean. Although not as easy to get around as the two-block town of Kaycee, the layout is very similar. Rundle Mall acts as the base camp of the city, providing shopping and plenty of entertainment. The rest of the city stretches off from there. Adelaide provides a perfect place for my best of both worlds; the Australian city experience my dreams have led me to temporarily live in, and the wide open western (although southern here) skies only a short ride away. The buildings may block the sunrise on an Australian morning, but just outside the city there is plenty of range to watch the cotton candy clouds go by. If I were to live in Adelaide, every now and then I would have to trade in my shorts and sandals for my good ole pants and cowboy boots. 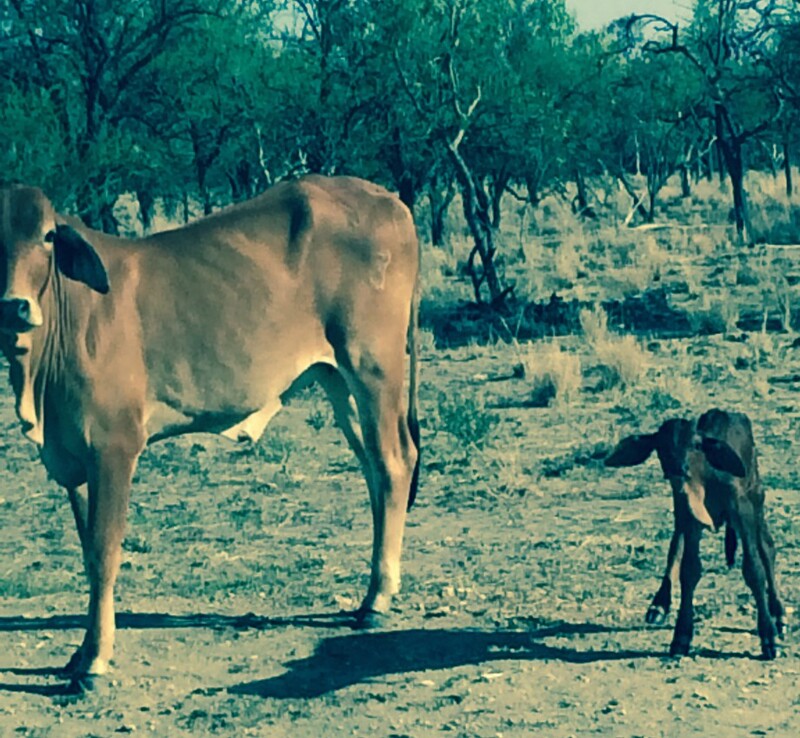 There is plenty of cattle country to explore and learn about. Most of the time, I don’t even consider myself living in a city. It is definitely not what I expected when I signed my dreams away and boarded my vessel for Adelaide. I couldn’t live my western lifestyle forever. I had to choose to chance the rapids and dare to dance the tide, all to see where my stop in Adelaide could take me. The Northern Lights may not shine down under, but this Australian journey is just a lock on the river I am sailing, lifting me to bigger and better opportunities. Adelaide is one of few cities I could live in, but my home will always be beneath those western skies. Some call me a sharp shooter. Whether it is with a pistol, rifle, or shotgun, I can be very deadly. Squirrels don’t stand a chance when I am behind the sights. At least that is what I hope squirrels and people say about my shooting skills. Really though, I always hit air and dirt. Rarely do I even get remotely close to what I am aiming at. I don’t let this get me down. I love going with friends, chasing squirrels and pigs, usually acting as a spotter and moral support. Darting between anthills in a left-handed stick shift truck, it wasn’t squirrels and pigs we were chasing. Colton, my new Australian mate Darcy, and I were chasing kangaroos and emus on Allensleigh Station in Queensland. This was at the stage where I was in awe at all the kangaroos, having never seen them before. They were everywhere. We would be driving around and spot a group of roos under a tree, and be able to drive within thirty feet without them budging. At home I can go squirrel hunting whenever I want. Roo hunting opportunities on the other hand don’t come up very often. So, I may have tried a little harder to hit a roo than I do squirrels. Six empty shell cases later, my one shot one kill motto was going great. I am responsible for six less roos in the population that has to be in the millions. Colton on the other hand was having a heck of a time. He usually is the one who never misses. I had the good Australian luck on my hands though. Emus proved themselves to be much harder to hit. Unlike roos who never move a muscle as you take aim, emu’s heads bob up and down as they are moving. Colton and I couldn’t connect, so Darcy had to show us how to do it. He proved that emus are very easy to fool. Walking away from the truck, Darcy performed an Egyptian dance and prance. He stopped a ways from the truck, and lay down on the ground. Continuing his odd movements, this time only horizontally. The emus began to get curious. All of a sudden they came running from a long distance off, maneuvered over a fence, and came near pecking distance to Darcy, who was lying on the ground. Sitting up fast, the birds never moved as Darcy took aim and fired. One shot later, we had emu appetizer for dinner. Emus are suckers for some good outback dancing. Darcy has his way of getting very close to wild animals, and I have my own yet different way. Mine involves using a rope. My wild animal-roping portfolio includes a fox from my middle school days and now a wild pig. Armed with three ropes, a four-wheeler, and a motorcycle, Colton, Luke from the Taldroa Station, and I set out in search of wild pigs. With me at the wheel of the four-wheeler and Colton sitting behind me, Colton threw a few coils of his rope, catching the pig around the middle. I bailed off and roped the head before it got out away and Luke came in and caught two hind feet. When we went to turn the pig loose, we all jumped on the four-wheeler and took off, the big boar we had just roped fresh on our heels. My one loop one catch motto proved perfect, as we didn’t see any more pigs. This was one difference from home as usually we see lots when we go pig hunting. Whether it is chasing kangaroos, emus,or pigs, I can now say they better watch out, as I am pretty successful in this big Australian outback. In the city though it’s a whole new story. 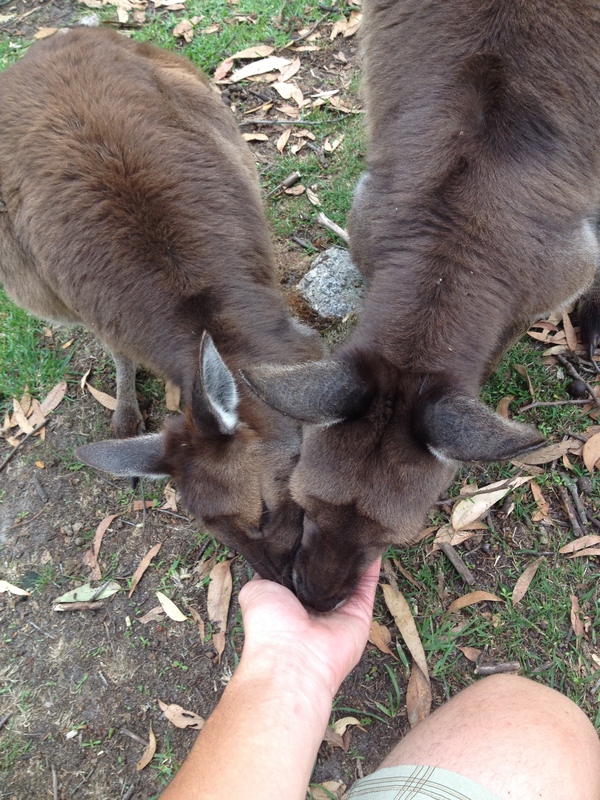 As we visited the wildlife park, I found myself feeding roos and emus out of the palm of my hands. I communicated to them with love, as I would do my cows at home. Their soft fur indicated they aren’t considered pests as in the outback but instead pets. However, one things for sure, I never found myself behind the wheel adding one more road kill kangaroo to the side of the road on our long journey. It is amazing at what simple things can fill my mind with memories, so basic and original, that most people wouldn’t want to listen about. The happiness I find from pure confusion and just wandering, acting like I have a plan. However, I really don’t have a plan at all. All I know is that I have a destination in mind, but no directions to get there. Kind of ironic when recently I answered a question of what my personal strength may be with the 6 P’s. The 6 P’s are Proper Planning Prevents Piss Poor Performance. The 6 P’s originated with my Grandpa, and have been handed down through my Dad to me. It involves planning, organizing, arriving, and completing what you started out to do. If I want to do something, I need to plan it out. My lack of planning was showcased in our class trip to Haigh’s Chocolate factory. I knew we had to take the tram to get there, walk a few minutes, and eat lunch somewhere along the way. Basic planning is all I had done. I had done my research only through a pamphlet, failing to research bus schedules and prices, read reviews, and gather others advice. Organizing involves working with others schedules and fitting them into what I have planned. Always arrive early, no matter what, so that when others arrive, you have everything sorted out. Always finish what you started out to do, even if it some adjustments must be made. If you set out to do something or try something, don’t let anything set you back. I was on a mission for chocolate. Although our journey in search of Haigh’s lacked the 6 P’s, I learned that memories could be made and remembered through spontaneous stops along the way. Wandering Rundle Mall, faced with hunger and varying taste buds, an unplanned stop at the food court was necessary. This stop reminded me of my family and when we go out to eat. Although most of the time my Dad heavily researches our food options before we leave the house, sometimes we do what we call punt, and eat wherever looks best when we get there. My Dad and I pretty much always choose to go to a hamburger place, where my Sister and Mom prefer salads and Chinese food. One thing is for certain though, we always have a definite stop after our meal for chocolate. We aren’t picky about our chocolate. It can come on a donut, cake, ice cream, or just a regular chocolate bar. Touring the Haigh’s Chocolate factory provided me with this chocolate experience I am so used to having after a meal with my family. Walking around the store and production facility, I could pick out exactly what my family would get. My Mom would go right for the dark chocolate, while my Dad loves the chocolate with the salted caramel filling. My sister on the other hand loves white chocolate, and would have gotten a bag of the white Santa Claus clearance chocolate. Just being at the Haigh’s chocolate factory and eating a hamburger for lunch reminds me of great times spent in Oregon with a family called the Haighs. I spent two summers working in Oregon, and one of my favorite parts besides all the great people was the food. Every Friday night, we would all gather at Haigh’s house where they would make the best hamburgers and fresh cut fries I have ever had. That’s a food review coming from a hamburger connoisseur. These great memories of going out to eat with my family and our search for chocolate after, along with a summer of my favorite hamburgers with the Haigh’s, were all brought on because of my lack of proper planning. Every now and then it’s time to put your strengths behind you and just go for it. Although this isn’t what I was planning on doing when we set out for Haigh’s Chocolate factory, the memories that I made and remembered by lacking the 6 P’s were well worth it. I know one thing I learned is that the lack of Proper Planning doesn’t always lead to Piss Poor Performance. The chocolate was well worth our spontaneous stops and illegal tram rides. “Beef. It’s what’s for dinner. “ My families life motto as we depend on the beef industry for our main source of income in the United States. When my family and I entered the Australian outback a little over two weeks ago, I had no idea what I would be eating. We all joked that we would be living off of kangaroo and emu for the next few weeks, an idea I wasn’t so sure about. However, after arriving in the dark to the first cattle station we were to stay at, and after seeing hundreds of dead kangaroos along the road, I was very happy to see steak at the dinner table. Rump steak in particular. For the next two weeks, after traveling roughly 1,000 km into the outback from station to station, we ate rump steak at least once a day. Makes sense when all the stations we visited had at least 15,000 mother cows and half a million acres of land. At home we eat a lot of beef, but still consume chicken on a regular basis. We say, “ Beef producers must eat chicken every so often so that chicken producers can afford to eat beef.” In the outback it is a whole different story. Besides bacon and ham for breakfast, every meal is focused around beef. Each cattle station has a walk in cooler used for storing vegetables and fruit, along with dry aging their own beef. When I build a house of my own, I am going to put in a cooler room, because the quality and tenderness of the dry aged beef was incredible. I quickly learned why the stations harvest their own beef. At the few small grocery stores we came across on our road trip, the only meat sold was beef, but the quality looked very poor. The cuts sold were roasts and steaks, but not once was hamburger ever sold. Maybe because hamburger isn’t sold fast enough and spoils, where packaged steaks can age over time through wet aging. None of the packaged meat had the date packaged or when it should be sold by displayed, only the prices. The prices looked a little less than at home, but much more expensive than the beef I discovered as my travels brought me to Adelaide. In Adelaide, for the first time ever, my college budget can afford more beef than chicken. Adelaide is one of the few places I have found chicken more expensive than a quality cut of beef. Even though most of the beef is grass fed and lacks the corn fed flavors from home, I will always choose beef before chicken. Heck, maybe in Australia the chicken producers must eat beef so the beef farmers can afford chicken. As a consumer, I would never complain about buying tasty beef cheaper than bland chicken. As a producer though, the cheap price of beef reflects the low cost producers receive for their cattle on the market. The United States and Australia beef producers currently face a tradeoff on the price received for beef and herd sizes, with the U.S. facing low herd sizes and high prices. The outlook for the Australian beef industry is believed to have rising prices for producers in the upcoming years, which will reflect higher prices for consumers. On my travels, I have tried and enjoyed kangaroo and emu, but plan to take full advantage of the low beef prices. My journey in Australia so far has allowed me to experience my ranching lifestyle in another country, with much different terrain and breeds of cattle. No matter how large or small one’s beef herd may be, or how different their cattle may look, one’s passion for the beef industry will always remain strong through low and high prices.